Ampthill are aiming to bring the curtain down on the most successful season in the club’s history by ensuring a third place finish in National One when they host Cambridge this afternoon. 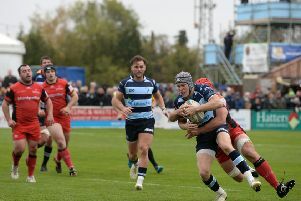 The A’s have already equalled last season’s points tally with two games still to play, and ahead of their final home fixture of the season, director of rugby Mark Lavery said: "Win and we’re third. It’s important to sign off the season at home with a W; we’ll be starting as favourites, it’s our place and the pressure’s on us and rightly so, we expect to win. “That said, they’ll challenge our systems, they’ll be looking to play. They pose a significant challenge and, of course, we know they’ll bring a crowd with them. “What’s important is that this playing group get through the next couple of games correctly – then we’ll see where we are and start thinking about next season. "We let ourselves down away at Plymouth, we had enough possession and territory to win the game but we were nowhere near accurate enough, ultimately, we weren’t good enough; we expect more from ourselves." The Ampthill pack includes former Tongan internationals Maama Molitika at number 8, Aleki Lutui in the front row and lock, Paino Hehea; Ben Gulliver [pictured] joins Hehea in the second row with James Wright [loosehead], Matt Collins [tighthead], in front of Syd Blackmore [blindside] and Joe Bercis [openside]. Gav Williams [scrum half] returns to partner Stef Jones  at half back, with Will Goodge [inside] and Elliott Reeder [outside] in the centre; Karim Lynch starts at full back with Sam Baker [left] and Pete Weightman [right] on either wing. Kick off at Dillingham Park is at 3pm.